PlayUp Tools Exporter version 1.0.1 fixes an issue introduced with SketchUp 2014 where colored (not textured) faces were not exporting correctly to CryENGINE. In addition, the Unity 3D exporter now allows you to specify a custom export path. You can also change the location outside of preferences when saving your level file. Please note that the new Unity 3D feature requires you to update your PlayUp to Unity 3D Importer package in order to load assets from the custom directory correctly. 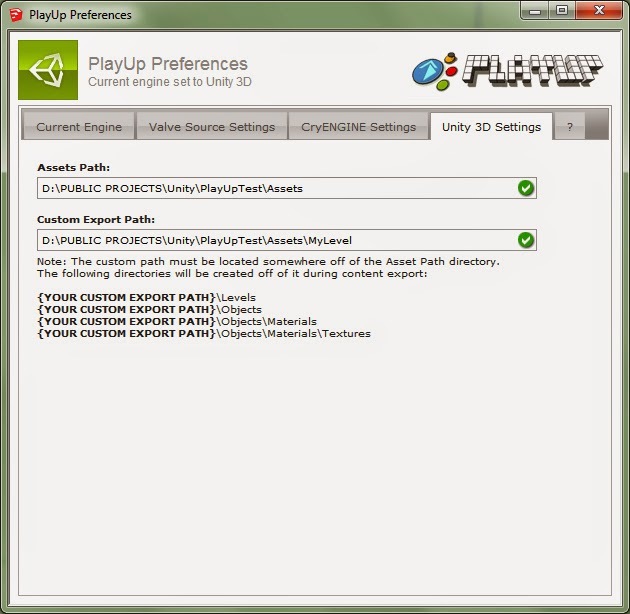 The latest version of the PlayUp to Unity 3D Importer is located on the PlayUp Download page.